An image from Maria Butina's family photo album. 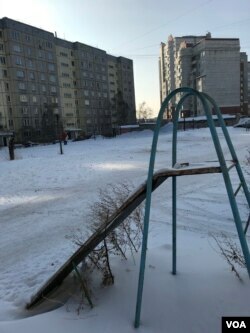 Even in the densely packed Soviet-era apartment blocks at the edge of this faded Siberian industrial hub, little redheaded Masha always seemed to stand out. "She was quite an unusual kid to some extent — physically quite tall in comparison with her peers, and she was in fact much more physically developed," says her father, Valeriy Butin, a retired 55-year-old manufacturing engineer. "Since childhood she had the strongly marked characteristics of a leader," he says. "She enjoyed giving commands, organizing her peers, her brother and her sister. She has always tried to carry herself as a leader. That was just natural for her." Soft-spoken with a patient disposition, Valeriy is also unfailingly polite. Even upon declining initial interview requests, he would nonetheless thank us for asking and apologize for needing time to consider. Maria Butina: Naïve Idealist or Dangerous Conspirator? Meeting me and a videographer at the cafe beside our hotel, he seems oblivious to patrons who appear to recognize him immediately, even if they don't dare say so. Having agreed to the interview, he waits for us out in the car where, through the cafe window, he seems adrift in an aimless stare, his thoughts likely turning to a Virginia jail cell where his daughter, Maria Valeriyevna Butina, has been held in solitary confinement since U.S. officials brought espionage-related charges against her in July. 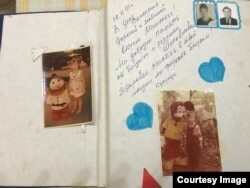 Despite a December plea bargain, Valeriy, just like his friends and family, still can't square the foreign media depiction of a confessed foreign agent with his precocious daughter who, until weeks of incarceration, mailed home report cards and research papers — cherished tokens of the myriad academic accomplishments the family has scrapbooked since primary school. "She was always gifted with a good memory and inquisitive mind, a willingness to research and really grasp something new," he says, his vocal pitch beginning to tremble. "I have no doubt it was — it is natural for her." Touching down on the chemically treated asphalt at Barnaul International Airport in southwestern Siberia, the pilot halts the plane at the end of the runway and pivots the nose onto a massive five-centimeter-thick expanse of plow-scarred ice and snowpack. Descending the airstairs to board a bus idling in the deep freeze of early dawn, passengers trudge through the glare of a single floodlight as four policemen in matching black Ushankas look on in silence, the only sound an engine and the rhythmic crunching of snow under boots. Nestled between the northern borders of Kazakhstan and Mongolia, Barnaul lies 228 kilometers due south of Novosibirsk, the Stalin-era gateway to Aleksandr Solzhenitsyn's "Gulag Archipelago." Like nearly all of its centrally planned neighboring municipalities, the city, which is the administrative seat of the Altai Krai region, immediately evokes memories of its Soviet past. Once known for manufacturing tanks, ammunition and tractors, Barnaul — also like its neighbors — has long since seen most of those jobs disappear. At left, the tenement building where Maria Butina lived till age 18 in Barnual, Russia, January 11, 2019 (P. Cobus/VOA). A half-hour from the airport in a flat grid of city blocks where Maria Butina spent her first 20 years, camouflage-clad hunters tote bagged rifles alongside morning commuters with briefcases. For many youth, it's the kind of place where one aspires to nothing more than one day residing anyplace else. "The official statistics brought me into a state of dismay," Butina wrote of regional brain drain in a 2008 essay for a local paper. "Last year the number of people leaving the region was 9,383 more than those who came to my native Altai." As an 18-year-old college junior, she was already a Rotary Club member who had recently been elected to a civic organization comprising "prominent citizens and representatives of national and regional NGOs" that aimed to be a conduit between voters and lawmakers. "When first elected, I wondered if it would be possible to transform the region into a place with lifelong professional prospects for my peers," Butina wrote. "Now I'm pretty confident [that]… if someone doesn't 'rejuvenate' the regional elite, programs will neither succeed nor stop the young from leaving." Adjacent to the Krai Administration building in Barnaul's Soviets Square, the School of Real Politics (SRP) was architecturally designed to contrast with the stodgy edifice beside it that, until just years ago, still hosted regional legislative sessions. "Maria came to the Real Politics faculty in 2005, where she instantly showed herself as an active leader," said Konstantin Emeshin, SRP's founder and, as Valeriy tells it, the personal mentor who perhaps more than any other individual has shaped his daughter's worldview. Although not formally affiliated with Altai State University, where Butina was concurrently enrolled, Emeshin’s “faculty,” as he calls it, is a government-subsidized, politically independent private organization that trains aspiring politicians and lobbyists. Emeshin also said the similarly named "Real Politics School” in Ivanovo, which is backed by President Vladimir Putin's United Russia Party, has no relation to his Barnaul-based organization. The concept behind SRP, he said, is that "'real policy' doesn't come from the TV set." "Television channels as a rule broadcast information as well as propaganda, whereas real politics is always made by [actual] deputies, officials." In "real politics," he said, students are immersed in day-to-day parliamentary life, in government life, communicating directly with officials, even at the highest levels. After her first year, Butina's SRP peers elected her school coordinator, a coveted position in which the chosen student reports on legislation and wrangles VIPs for on-site events. Smitten by her boundless energy and networking savvy, Emeshin nominated her for the prestigious Seliger forum for young leaders. The annual lakeside gathering — once dubbed "Russia's nationalist summer camp" and sometimes attended by President Vladimir Putin — invites participants to give presentations of their work. Having solicited the sponsorship of local businessmen, Butina would be expected to champion a regional cause. At the time, Emeshin said, short-barrel arms legalization was strongly supported by Altai regional Governor Alexander Bogdanovich Karlin. In Russia, private citizens can be licensed to own long-barreled shotguns, stun guns and gas pistols, but handguns and assault rifles are banned for the broader public. Like a handful of provincial Russian politicians, Karlin had long framed pistol ownership as a civilian rights issue, but in his economically struggling region it meant more than that: Altai Krai is also home to one of the only small-arms bullet manufacturers in Russia. For the daughter of an avid hunter, a personal history of proximity to firearms suddenly dovetailed with a politically practical, intensely local cause. At Seliger, Butina connected with politically like-minded activists and expanded the pistol rights debate to the federal level, hosting roundtables throughout the country. "It was no secret that Senator [Aleksandr] Torshin," long an avid gun rights supporter, "was now in touch with Maria." "She knew everybody: [Alexei] Kudrin, [Andrey] Nechayev, she was at the top of public activities of Russia," said Emeshin, referring to a close Putin ally and a former economic minister respectively. 'It’s great when your morning starts like this,' Tweets then-Senator Aleksandr Torshin of his personal aide, Maria Butina, from a hotel lobby on March 18, 2015. ​Emeshin then encouraged Butina to pursue graduate work abroad, telling her in a 2014 Facebook message, "having mastered real politics at the city, regional and federal level, you should certainly master it at the international level." For personal friends, Butina's skyrocketing career came as no surprise. "At the time, she seemed to be quite the young idealist, a person who awakes with an idea of changing the world," said Lev Sekerzhinsky, a Barnaul-based photographer who was close to Butina before she departed for Moscow. "But unlike most people, she woke up not just with an idea but with some real energy … just a willful determination to implement all the plans to do something good. "Every day she had to be doing something," he recalled. "I've never met anyone else like her in all my life." Asked whether she could have turned that energy against the interests of a foreign nation, he was unconvinced. "I've read trial documents saying she was doing or planning things against the United States, but I'm pretty confident she wanted to improve ties," he said. "It's quite a pity if she violated some laws on the way." In this courtroom sketch, accused Russian agent Maria Butina pleads guilty to a single conspiracy charge in a deal with prosecutors and admitted to working with a top Russian official to infiltrate a powerful gun-rights group and influence U.S. policy toward Moscow. On December 13, Butina pleaded guilty to conspiracy, engaging in unofficial diplomacy and lobbying after building relationships in American conservative circles — including the National Rifle Association — not unlike what she did on behalf of Altai officials at Seliger. She also admitted to working at the behest of her ex-employer, former Senator Torshin, to create back-channel communications between NRA contacts and Russian officials. "She was playing a role familiar to professional intelligence officers…using her natural network of contacts to spot, meet, and assess potential targets for the Russian espionage apparatus," writes Atlantic Monthly contributor John Sipher, a 28-year veteran of the CIA's clandestine service and a Brookings Institution authority on espionage. Describing modern Russia as "the world's first intelligence state" and Putin's actions as "those of a superpowered spy chief," any Russian national living abroad — especially politically connected former State Duma aides such as Butina — can be tapped to act informally as the "overt face of covert operations." Ambitious young professionals who wish to maintain career options at home, said longtime Russian affairs reporter Danila Galperovich, often have little choice but to accommodate the intelligence inquiries, which, for many, inevitably blur boundaries between networking, lobbying and espionage. "Can they be approached at any time? Yeah, absolutely, the same way, if we're perfectly honest, a congressional aide in Washington can be approached by the CIA," said Mark Galeotti, a globally renowned expert on Russian intelligence. "But is there any evidence of her being a spy in the sense of someone who actually works for the Russian intelligence apparatus? For me, the answer is absolutely not," he said. "I think what this all simply reflects is the way modern Russia works." As Galeotti tells it, Russia's president sets broad policy directives, "and then all these scurrying little entrepreneurs will use whatever leverage or interest they themselves have — and it may be totally different if you're an ambassador compared to if you're a journalist compared to if you're whatever else" — to further those Kremlin interests. "If they fail? Well, the Kremlin's no worse off; it can deny anything and it hasn't spent a penny," he said. "But if they succeed, then sometimes the Kremlin will actually reach in and, in effect, takeover an operation, or simply reward them for a job well done." Calling Butina "ambitious in a perfectly normal way," Galeotti also said her long history of advocating gun rights made the NRA a logical place to network, and "because of the extent to which the NRA and the Republican Party are incestuously intertwined, you can't really network in one without the other." The best way to detect the presence of formal intelligence directives, he added, is by identifying a given suspect's behavioral anomalies. "Look at friendships pursued that, otherwise, just don't seem to make sense or seem to fit a pattern," he said. "Quite frankly, if one looks at what Butina was doing, it all seems pretty consistent with someone who's just trying to see where she can get, see what she can do." Former Senator Torshin, who declined multiple phone and email requests for interview, has long operated in this gray area between personal ambition and political favor. "If you operate in Russia, you know this," said Galeotti. "Everyone is constantly looking for what kind of blat, what kind of connections, what kind of leverage they can find. That's just the nature of this environment." But Yuri Shvets, a former KGB major who worked in the Washington office of the Soviet First Chief Directorate, the intelligence organization responsible for foreign operations, said the NRA has been a target of Soviet infiltration since at least the 1980s. "She is certainly an 'agent' [of the Russian government], whether an active duty one or just an 'agent of influence' I don't know," said Shvets, who defected to the West in the early 1990s. "But after the Anna Chapman story, I wouldn't be surprised by anything." American prosecutors in June said Butina possessed materials indicating direct communication with a Russian intelligence service, although the final affidavit cites none. Road into the neighborhood outside Barnaul, where Valeriy and Irina Butin moved after their children had left for university, Jan. 11, 2019 (P. Cobus/VOA). Driving to the Butin family home, Valeriy's gray late-model Nissan SUV shoots down a snowy stretch of canopied coniferous byway about 32 kilometers west of Barnaul. I tell him that I can see why Solzhenitsyn chose voluntary exile in the U.S. state of Vermont, that the surrounding pines could pass for a postcard from Stowe. "I've heard it's lovely," he said. "But we've got more bears." Does the lifelong hunter advocate the pistol legalization his daughter championed? "I'm not as political as my daughter is," he said after hesitating, like it's the first time he's been asked. "But I think it's important that one should at least have the right, if only for personal protection. Valeriy Butin, Maria Butina's father, in Barnual, Russia, January 11, 2019 (R. Marquina-Montanana /VOA). "Look at this guy in Kerch," he said, referring to an October shooting at a polytechnic college in Russian-occupied Crimea that claimed 20 victims. "This young man bought a gun absolutely legally and goes on a rampage, but nobody could do anything because of gun restrictions. What if just one other person there had had a gun? "To me legalization just means you can have an opportunity to protect yourself against these insane people, and they're everywhere," he said. "Yeah, they're here — and in America, too." As the road crests, we bear left down a snow-rutted unpaved access lane leading into a sprawling warren of scattered structures that betray a range of income levels. Some homes are new, some are old or restored, and a handful were abandoned mid-construction, the skeletal rebar-and-cement casualties of Russia's chronic boom-and-bust economic cycles. Entering the Butin family drive, an automated steel gate slides open, revealing a low-slung structure all but buried in snow. On setting foot in the entryway, Maria's younger sister, Marina, crosses the house to greet us and insists on taking our coats. "You're from Washington," she sighs in almost unaccented English. "Such a cool city." Placing an arm around a sprightly older woman who emerges from the kitchen, Marina introduces her grandmother. "This is the American?" she asks Marina, who nods. "Welcome," says the elderly woman, offering a hand and holding tight with a lengthy penetrating stare. "I'll put on tea." Arrayed on a table are family albums that chronicle the achievements of each Butin child. The photos and clippings show just how much academic engagement and school-based events were an organizing principle in the Butin household, which, until their youngest child left for university, had been located within a half-block of a primary school. Maria Butina's sister, Marina, in Barnual, Russia, January 11, 2019 (R. Marquina-Montanana /VOA). At only 24, Maria's younger sister holds multiple degrees from one of Russia's elite polytechnic universities in St. Petersburg, where she has since joined an electronics manufacturing firm. Like both of her parents, she is an engineer, and like both of her parents, she learned of Maria's incarceration via news reports. "I was in the car, going to work and I didn't know what had happened," says Marina, who had spoken with her older sister at least once weekly until the arrest. "I was confused when I heard her name and just pulled over and fell silent," she recalls. "I thought it was fake news, and then I thought maybe after two days everything would be okay, that this was all a big misunderstanding." Since learning of his daughter's incarceration on television that same morning, Valeriy says his first impressions of the accusations are unchanged. "I can only imagine it must have been Maria's legal ignorance about the details of these [lobbying] laws, that her absolutely friendly activities resulted in such an accusation," he says, insisting that his daughter was fond of the United States and wanted to see relations improved. "Maria couldn't possibly wish any harm to the country where she was studying, that she treats with great respect." Maria's mother, Irina, says her daughter often spoke of participating "in some global decisions undertaken for (her) country and to be a public figure." Irina Butin, Barnaul, Russia, January 11, 2019 (R. Marquina-Montanana/VOA). "Masha did these things without any deliberate intentions," she says. "I am confident that any illegal activity resulted from her legal ignorance, her young years, her drive, persistence, and of course some naïveté." Although the U.S. indictment refutes that opinion, the family remains hopeful not only that their daughter will be deported immediately after her next hearing, but that U.S.-Russian ties can be salvaged. "Our two countries are simply obliged to exist peacefully, at a minimum," says Valeriy, adding that he's personally optimistic they can achieve "absolutely friendly, good relations." Characteristically polite, Valeriy asks us to convey a message to his daughter's lawyers, that he's "grateful for their diligence and impartiality." Our questions about whether Russian officials have been adequately supportive draws an exhale of mild exasperation. Although their story has been amplified via state-media news interviews, he says, the family remains financially dependent upon crowdfunding to deal with more than $500,000 in legal fees. Asked what he would say directly to President Donald Trump and other top U.S. officials, Valeriy appears to have tears welling in his eyes. "It is difficult to consider what one could say to the U.S. president, as well as to the Secretary of State," he says. "But if something will depend on them, I would ask them to release her as soon as possible." Regardless of whether the upcoming court ruling can secure Maria's release — let alone help mend U.S.-Russian ties — her younger sister sees some good resulting from the incarceration. "I want her to stand firm and know that, despite the conditions of solitary confinement, the large distance separating us, she is actually the one keeping us all in the right mind set," she says. "She reminds us that everything will be tackled, that everything will be okay, that truth and justice will prevail." "These are the basics we laid from childhood," says Irina, calling their family bond the "thread" to which her daughter holds tight in a Virginia jail. Even for professor Emeshin, the weighty darkness of a naïve, high-energy extrovert stuck in solitary confinement may yet have one silver lining. "She is unusually talented, an incredibly clever girl, you can't deny that," he said earlier that day. "That's why she chose the path of public life, why she took charge of the school's information center, joined our public chamber and quickly leaped to federal-level work." For better or worse, he said, she's found herself in the high-profile international role she always sought. "Quite a complicated one, yes, but still a real experience," he said. "She's now well-known and, like any decent and honest person from this country, she'll come to occupy a worthy spot in Russia's political sphere." Olga Pavlova in Moscow, Ricardo Marquina in Barnaul, Igor Tsikhanenka in Washington contributed to this report.